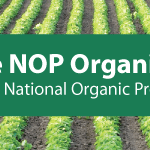 Virtual press conference – farmers take over organic certification. To unmute, click on the sound icon in the lower right corner of the video. Cornucopia’s executive director Mark Kastel offered a short presentation and Q&A on The Cornucopia Institute’s newest report analyzing the performance of the nation’s approximately 45 domestic organic certifiers, The Gatekeepers of Organic Integrity. Back in the 1980s, when the organic community petitioned Congress to develop a single, enforceable organic standard under federal law, we built in safeguards to protect the process from influence by corporate lobbyists. That included the National Organic Standards Board as a policymaking buffer and a strict accreditation/auditing program by the USDA overseeing independent certifiers as their legal agents (mitigating a clear economic conflict of interest). Unfortunately, the NOSB has been stacked with members of the powerful industry lobby group, the Organic Trade Association. USDA leadership, of both parties, has sided with corporate agribusiness and the certifiers have accepted large fees allowing their “clients” to violate the spirit and letter of the law. For the first time, farmers and organic businesses, that pay the certifiers, can choose to invest their hard-earned money with certifiers that are just as dedicated as they are in protecting the reputation of the organic label and interests of their loyal urban customers. Organic Transparency/Respect? We Need Your Intelligence Help. 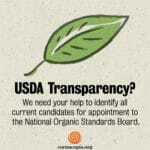 NOTICE: USDA Keeps Organic Stakeholders in the Dark — Incompetence or Corruption?